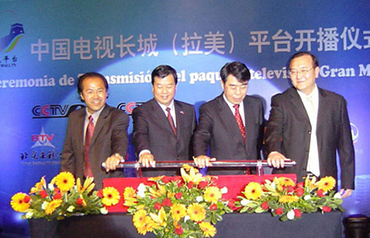 On January 1st, 2008, China International Television Corporation (CICC) joined with Atlanta DTH, Inc. to provide 15 Chinese channels under the Great Wall (Latin America) Platform to Latin America through direct satellite broadcast. Great Wall (Latin America) Platform displays Chinese culture and contemporary China in a multitude of perspectives.Not only does the Great Wall (Latin America) Platform service the needs of overseas Chinese immigrants, it has also opened a window for English and Spanish speakers to better understand China. Great Wall (Latin America) Platform carries the following channels: CCTV-4 (Chinese International), CCTV-News, CCTV-E, CCTV-Opera, CCTV- Enterntainment, CCTV-Movies, China Beijing TV Station(BTV), Dragon TV, Southern Television Guangdong (TVS), JSTV-International, Fujian Strait TV, Hunan TV World, China Yellow River TV (CYRTV), Xiamen Star, ZTV-World.